Have you ever packed a suitcase, gotten in the car, and just drove off with no destination in mind? I highly recommend it. It goes like this. Pick a predetermined amount of miles you want to travel, say about a hundred. Leave your neighborhood and then turn right. Now, drive a hundred miles, but only make right turns (or left–whatever floats your boat). Where are you now? The interstate? A weird street in a subdivision? The middle of a farmer’s field? Anyway, somewhere about now, turn on your GPS and find the coolest places closest to right about here. Or the absolute best way pick a destination? Close your eyes. Stand in front of the map of either the United States or the state you live in. Now put your finger out in space and try and hit the map. Open your eyes. If you are not in the ocean or on a remote island, then that is where you need to head to. Now get your keys. Let’s roll. I call this the Leap Before You Look decision process, also known as the Serendipity Principal. For most people, it’s really hard to do—to just get in a car, with the bare essentials—your wallet, a toothbrush, a change of clothes, a swiss army knife (I always have a swiss army knife, unless flying –you just never know!). To wake up and to literally not know where you’ll be by dinner time tonight for most people sounds too crazy, a little big unhinged. For most people it sounds…unsafe, maybe down right scary. Not me; I like to think of it as edgy but not so far as say, living on the edge, which is generally predicated by a fall of some sort. 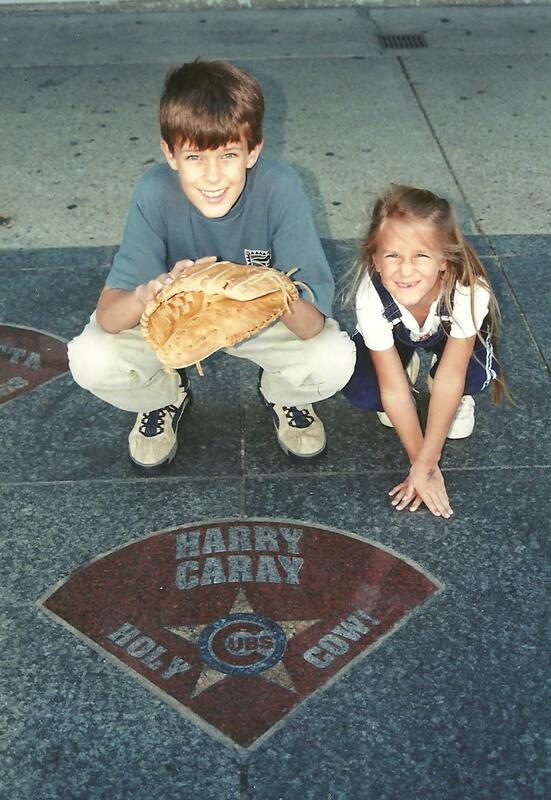 In 1999, I worked for a major airline when my daughter was 6 and my son was 11 ½. I was known to wake up and say, “Let’s go to Chicago and see if we can catch a Cubs game today!” We did this several times. But one particular unplanned trip stands out. Just the kids and I got to Chicago, and made it to Wrigley Field via train and bus in record time. The next stroke of luck was scoring two tickets in the second row at the front of the first base line. As soon as we went in, our backpack, and everyone else’s bags or purses were thoroughly searched. What in the world? Lucky for us, we had just flown, so no Swiss Army knife was found in my bag. Well, it turned out President Bill Clinton was coming. He arrived in the 5th inning. But thanks to getting our nearly front row seats, we were just a few yards away and diagonally we were about a stone’s throw away under the President’s box seat. I could read the label on his can of beer. We were that close. Forget my political stance; I couldn’t believe hours after waking up without a concrete plan, I’d be watching a baseball game with my sweet kids, seated near the President of the United States! We woke up that morning, went to the airport with nothing but my Mickey Mouse backpack, and a change of underwear and a toothbrush for each of us, and hoping we’d actually get a flight as we always had to travel stand-by. Instead we saw Sammy Sosa hit a game winning home run, which was actually a double miracle: One: My son’s baseball hero at the time was Sammy Sosa and Two: The Cubs WON!!! After the amazing game, we ventured over to the Navy Pier and late that night ate the best Chicago pizza! Our day had started at 5 am, and by 2 am, we had seen the President, witnessed two baseball miracles and were now tucked safely in bed in a random hotel we never had reservations to begin with. My kids were learning the art of traveling by way of serendipity. Another time, in 2006, before taking my daughter to school, after hearing on the radio that today was the last day the crew of Extreme Home Makeover was in town, I suddenly found it more important that morning, that she skip school, in order to go see Ty Pennington and crew who were in Raleigh finishing up a home for the TV show. It was the day of the Big Reveal. I mean seriously, which is more important, learning how to diagram sentences or learn a new geometry theorem, or watching an entire family’s lives change before your very eyes. Really, to me it’s a no-brainer. We shouted “Move that bus!” and got awesome reveal pictures and high-fived Ty as he ran by us. Last summer, while my daughter was in NYC for a week long dance competition, I rented a car to go see U2 in Philadelphia, which I did plan. However, once I arrived at the rental company, they had a situation where they couldn’t get me the economy car I requested. “Would you mind driving a Cadillac instead, no extra charge?” Me: Definitely not. Hey, wait a minute. There’s no place for ignition keys! Ah, who cares! A saner person may have wondered how I was going to navigate the streets of NYC in a totally computer-equipped, unfamiliar car and get to Philadelphia and back by myself, but not me. See this is a huge gift God has given me. I’m always up for the adventure. I don’t need a man, or a woman for that matter, beside me to feel secure. At least when it comes to traveling, I don’t necessarily have to have a game plan. I’m just the co-pilot who happens to be in the driver’s seat. I mean I knew I had to get to the concert, but that’s all I needed to know. I felt confident my 18 year old daughter, already a seasoned solo traveler to NYC (her 6th trip) would be fine for just twenty four hours at the hotel. (She totally survived without me, probably even thrived!) Once in Philadelphia, I met up with my husband’s sister who I had not seen in thirteen years and didn’t know what to expect. She and I had a blast. I met U2 fans who later became amazing friends. Only five days later, I would ever so briefly meet Bono and the Edge just outside our hotel, because of a stray comment I accidentally overheard another guest say because I just happened to be checking my U2 concert pics on the hotel lobby’s computers. I didn’t know they were in NYC since it was the middle of the U2 360 tour. I was only checking the pictures to kill time, while waiting on my daughter to come down from the room. Who knew? My favorite musicians of all time were only yards away from where I was, yet I met them without planning to. But that’s another blog. The thing I’ve learned about plans, on vacation and in life, is that plans are often foiled by the unexpected and end in frustration. The journeys that are traveled with an open mind, and no expectation of outcome often are the ones that become the lasting memories of your heart.